The historical doll that provided the inspiration for my interpretation is shown above. Through my studies over the last four decades one theme has resonated. Although the images are vastly different the imputes resonates with great similarity to masks and images from other cultures. 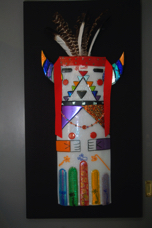 This Kachina is a male Katsinam who sings about the rain to other Katsinam. In February, the Katsinam arrive to help the Hopi prepare for the next growing season. Keep in mind that since these people depend on their harvest for all of their food, the planting, growing and harvest of the crops is central to everyday life. For this reason the ceremonies they perform reflect the essential of life: fertility, germination and early growth of seeds.